A couple of weeks ago we announced that we would holding a big giveaway to celebrate our 1st birthday, giving one person the chance to win a whole host of goodies donated (extremely) generously by Scottish bands and musicians. The clock is ticking, so we thought we would open the competition today. This is your chance to win albums, singles, vinyls, DVDs, t-shirts and bits n’ bobs from some of Scotland’s top acts – from rock to hip-hop, metal to electronica. There is even more stuff to be added to the prize fund however in the coming days – so keep an eye out on our Facebook and Twitter for updates of new additions. Click the links to check out the bands’ and musicians’ tunes and webistes. They deserve a million clicks for their kindness. 3. Wait patiently, and if you have been successful in the prize draw, you will notified via email. Postie will then bring you some joy. Today is a happy day – it is The Daily Dose‘s 1st birthday. 365 days ago we published our first post, an interview with gothic-rockers Flyleaf. Over the past year, we spoken to a number of stonking Scottish talent, chinwagged with the likes of Blink-182, Lissie and AFI, showcased Scottish photographers and dipped our toes in the darkside with our ‘Metal Monday’ feature. We also put on a number of gigs and was invited to a Tennent’s advertising launch – free beer all day – with fellow blogger Peenko. Why? We still don’t know. Yes indeed – roll up, roll up. At this very moment we are kindly being donated CDs, t-shirts, DVDs and almost everything in between (not quite) from Scottish bands and musicians across the country. 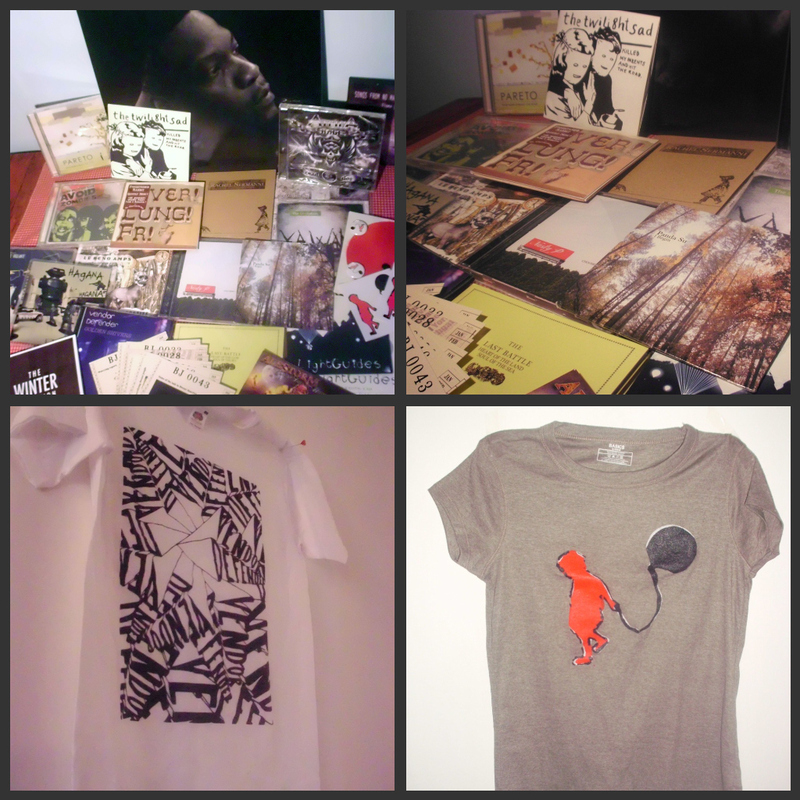 There will be goodies from bands we have featured on the blog before, and ones that we haven’t. It will all be chucked carefully into a box and will be the super-duper prize for our super-duper 1st birthday giveaway. The Daily Dose is teaming up again with Wull Swales of Define Pop/Sound Surrounds to put on another gig under the name of onewordPResents. 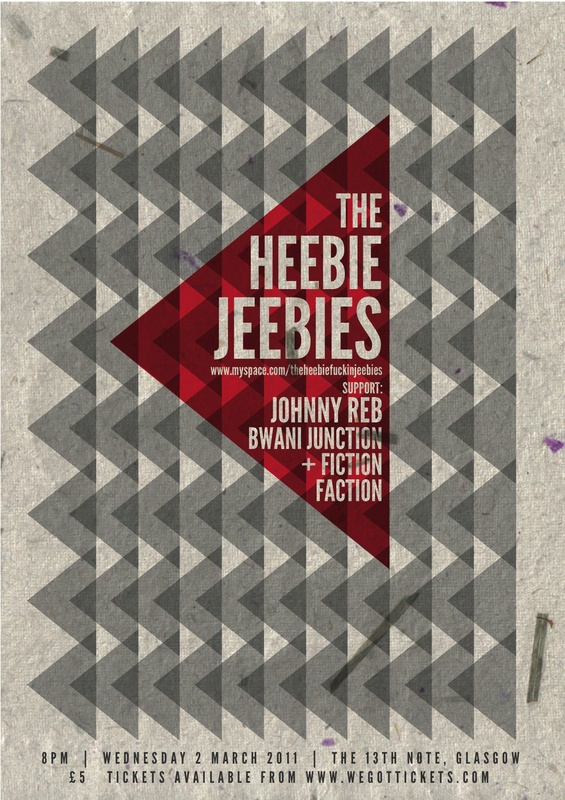 This time, on Wednesday 2nd March at the 13th Note in Glasgow, we’re bringing up English indie trio The Heebie Jeebies, who will be more than ably supported by three excellent Scottish acts. From Glasgow, Johnny Reb and Fiction Faction join the bill, whilst Edinburgh’s Bwani Junction also join the party. Tickets are £5 or available online here. It’ll be a blast. However, if you fancy winning a spot on the guestlist +1, simply email ‘Superfragilisticexpialidocious’ to hello@thedailydose.co.uk and whoever emails first, wins. THIS COMPETITION HAS NOW CLOSED. Sorry. We’re teaming up with Define Pop under the banner of ‘onewordPResents’ to put on the above show at the 13th Note in Glasgow on the 2nd of December – it should be a belter. 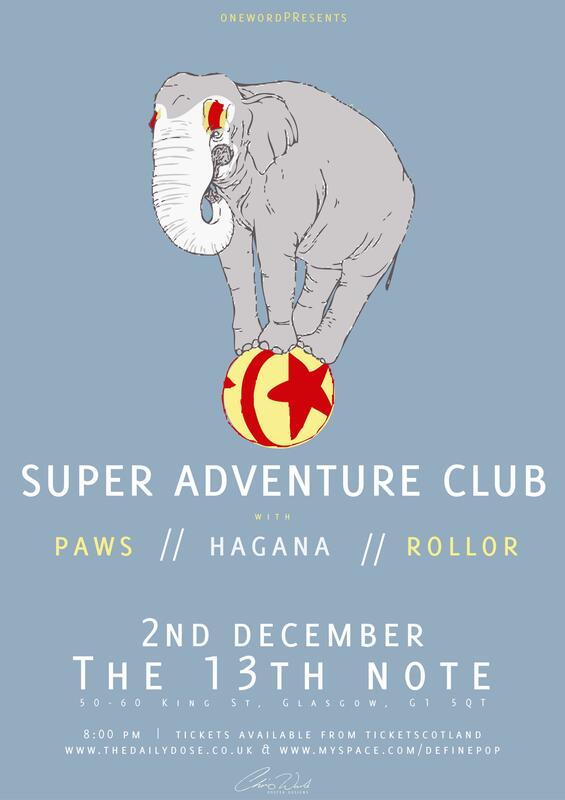 We’re giving away a spot on the guestlist along with a +1 so that you can bring your friend and have their socks blown off too by some of Scotland’s top alt-rock bands – Super Adventure Club, PAWS, Hagana and Rollor. To be in a with a chance of winning, simply send your name on a postcard (email) entitled ‘onewordPResents’ to: hello@thedailydose.co.uk by 5pm on Wednesday, 1st December. Another week and another competition – this time for one of Glasgow’s premier one ticket, multi-venue events. 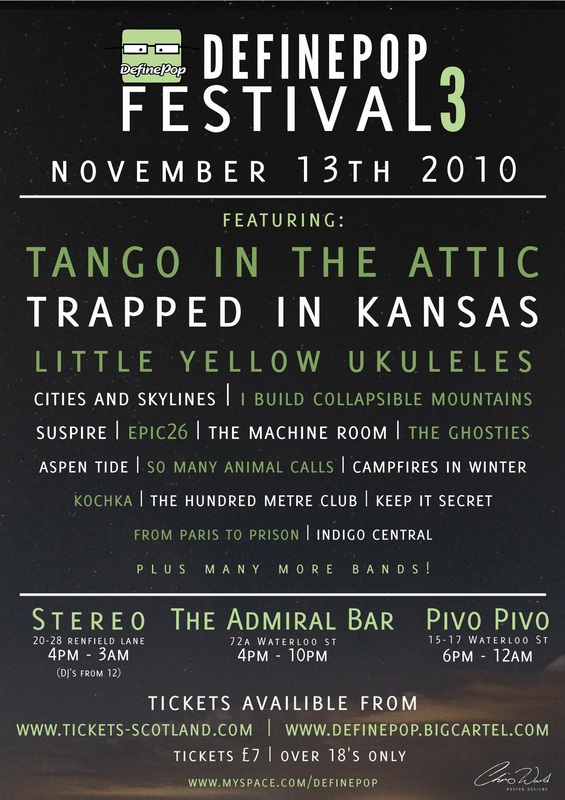 Define Pop are running their third festival this Saturday (Nov. 13) and it’s three venues – Stereo, Pivo Pivo and the Admiral Bar – are playing host to some of Scotland’s top local talent. There’s the likes of Tango In The Attic, Trapped In Kansas, Little Yellow Ukuleles, Suspire and I Build Collapsible Mountains spread across the three venues – and then DJs in Stereo to take in the small hours. How would you define ‘pop’ in one word? Please send your answer and your name to hello@thedailydose.co.uk by 5pm on Friday and the best answer will get a place on the guestlist +1. Win tickets to see Motorhead in Glasgow! It may/may not be hard to believe that legendary rockers Motorhead are celebrating their 35th anniversary. As part of their celebratory tour, they’re heading to Glasgow’s 02 Academy on Tuesday November 9 – and we’ve got two pairs of tickets to give away to two lucky gig-goers. In what year was Motorhead’s seminal album ‘Ace of Spades’ released? Send your answer, name and address in an emailed titled ‘Motorhead’ to hello@thedailydose.co.uk by 5pm on Sunday (Nov 7) to be in with a chance of winning. This ticket giveaway is brought to you by our chums at Live Nation and Kronenburg 1664, who have just launched a new advertising campaign featuring Motorhead performing a re-recorded, slowed down version of the supremely speedy classic track ‘Ace of Spades’. You can check out the ad on the Kronenburg Youtube Channel at http://bit.ly/K1664Motorhead or by taking a gander below.